What Makes Color Powder Coating a Desirable Finish? 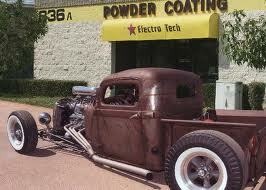 Learn More About Powder Coating with Electro Tech! If you want to revitalize a metal item, or you are simply researching how to color coat metal products, Electro Tech Powder Coating can help. What Makes Powder Coating a Desirable Finish? We are often asked, “Is powder coating stronger than paint?” The answers is an absolute, resounding, “Yes!” While paint just sits on the surface, powder coating actually bonds to metal items. An electrostatic powder in the color of your choice is applied to your metal item. The item is then cured using heat, and the powder flows together (similar to melting). However, the powder then electrostatically bonds to the metal forming a skin. While paint easily chips, scratches, and fades, powder coating brings a long-lasting durability to your items. This is why powder coating is especially popular for items that are exposed to the environment or receive a lot of wear and tear. For example, playground equipment, park benches, and even specialty vehicle parts are popular items to powder coat. Preparing metal products for powder coating requires a little advanced planning, but our team will help you discern what will level of preparation may be needed. For example, if an item has existing paint or rust on it, we may need to treat it to remove any existing finishes. Once your item is prepped, our team can quickly and easily transform your project to match your vision for the final product. Whether you are new to the concept, or an experienced manufacturer in need of top-quality powder coating services, our team provides the highest quality, most trusted services throughout the San Diego area. Because we run two shifts, our clients appreciate our exceptionally fast turnaround, commitment to quality, and personalized service. To learn more about powder coating, or to start your project, contact Electro Tech today!